Sure, it would have been a lot less fuss and bother to pay for the flood cleanup without Jools’ Not So Big New Flood Levy, but what’s the point of being Prime Minister if you can’t cause a bit of fuss and bother now and then? Gives us all something to tweet about anyway. The whole thing is just a storm in a teacup, and if the government had stuck to the teacups of the mums and dads of Australia, I wouldn’t have a problem with it, but when you mess with my flat white, even if it’s just one a week (and is it just a cup, or is it a mug, and who gets the jaffa?) there’s trouble. Okay, I could just order another flat white, but caffeine withdrawal makes me irrational. 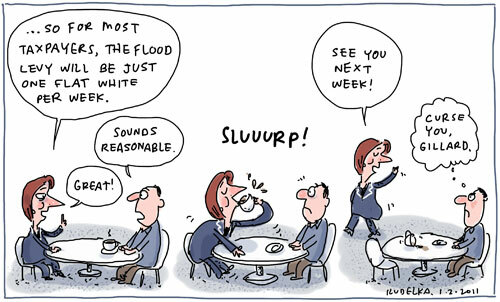 You can pry my flat white out of my cold dead hand, Gillard. In protest, I’m going back to macchiatos. Just another pot of quali-tea for me thanks! And no, Gillard you cant take that away from me, well not unless you add GST to tea…then that would change my whole day/week/life, and there would be a flood – of tears. I love you stuff, you know and I feel rather stupid saying this, but I don’t get it.Is it that the levy appears reasonable except for when we have it taken from our hand? Evan I try to avoid making a point wherever I can, but that’s pretty much it. I guess I am also gently taking the piss out of the “one flat white a week” line that got trotted out on the grounds that we don’t know what money is. Will she accept 10c on South Australian empty bottles and carton? The latte set will be revolting over this!